An Amherst Police Department patrol vehicle was involved in an accident on Sheridan Drive. 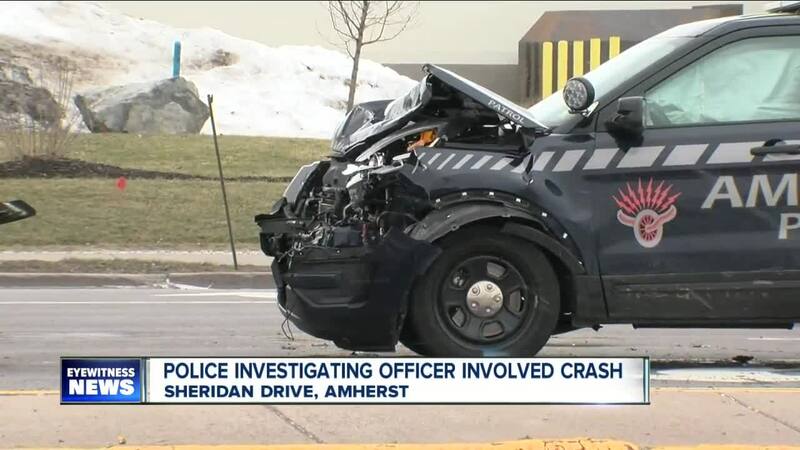 AMHERST, N.Y. (WKBW) — An Amherst Police Department patrol vehicle was involved in a crash Friday afternoon on Sheridan Drive near Niagara Falls Blvd. The officer was responding to assist another patrol before getting into the crash with a 2017 Ford driven by a 71-year-old Buffalo man. The officer was taken to Millard Fillmore Suburban Hospital with non-life-threatening injuries while the other driver was taken to Kenmore Mercy Hospital with a minor injury. The accident is currently under investigation. Anyone with information related to the incident can call the Amherst Police Department at 689-1311.